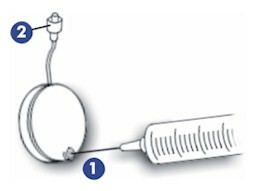 Insert a needle (20 to 22G) into the septum(1) and, while holding the pump as shown, inject the fluid into the chamber until it appears at the tip of the Luer(2). Make sure the fluid chamber is free or air bubbles. 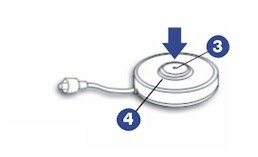 Start the pump by pressing the protruding start button(3) until flush with the button ring(4). Med-e-Cell can suggest a variety of methods for attaching and securing the Infu-DiskTM for topical or subcutaneous delivery of fluids and medications. Please call us for details.